The man known throughout the world as “Mr. 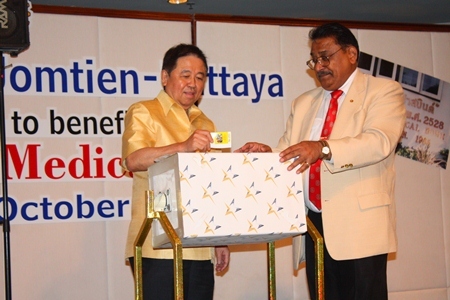 Pattaya” was fondly remembered on Saturday, October 20, at the Royal Cliff Beach Hotel. 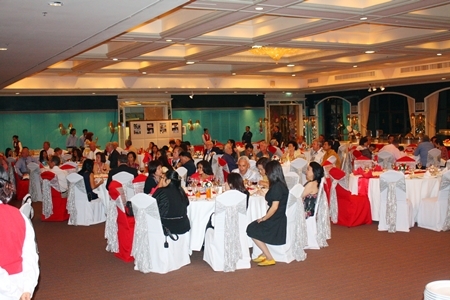 A gala Swiss buffet was provided for the guests, who had come to remember the late Alois X Fassbind and to assist with his personal charity, the Fassbind Medical Home within the Banglamung Old People’s Home. 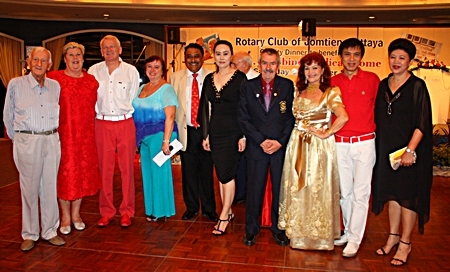 Organized by the Rotary Club of Jomtien-Pattaya, with hard-working MC Peter Malhotra at the helm, it was a splendid occasion with the ladies in their finery, and the gentlemen in suave fashions, such as Andrew Wood’s red shoes and trousers teamed with a white shirt to reflect the Swiss national colors. 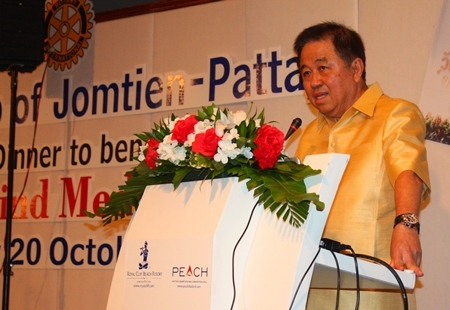 Senator Sutham Phanthusak speaks of his long friendship with Louis in the old days. 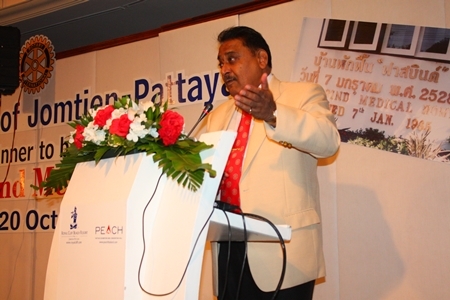 MC Peter Malhotra, a two-term past president of the Jomtien-Pattaya Rotary Club and Past District Governor of District 3340, spoke eloquently of Louis Fassbind’s achievements in Pattaya, his ‘adoption’ of Bamboo Island and how he would present visitors to the island with rubbish bags to clean up the beach. 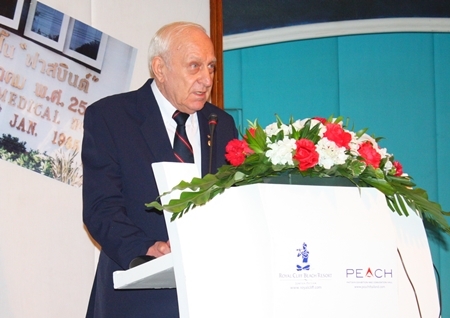 He also took the guests through a slide show with Louis Fassbind appearing his ebullient self and enjoying assisting the elderly folk at the Banglamung Home. 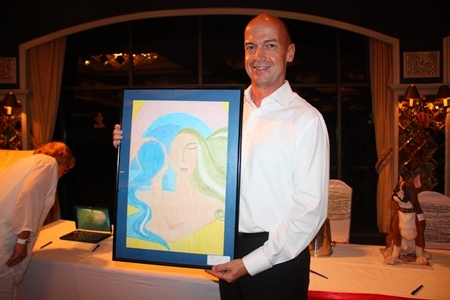 For the more senior guests it was a time to reminisce, with the tales involving Louis Fassbind now attaining legend status. 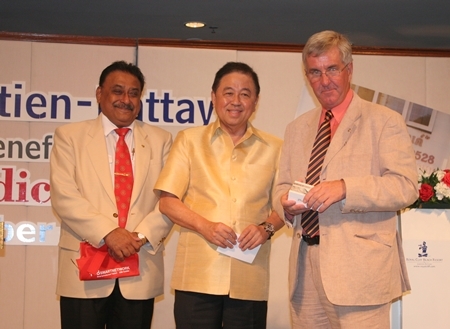 One of the people present was Senator Sutham Phanthusak, who took to the podium to tell of his work with Louis Fassbind when both had junior positions in a Bangkok hotel, and how they both continued to enjoy each other’s company as they progressed through the ranks and both ended up in Pattaya. 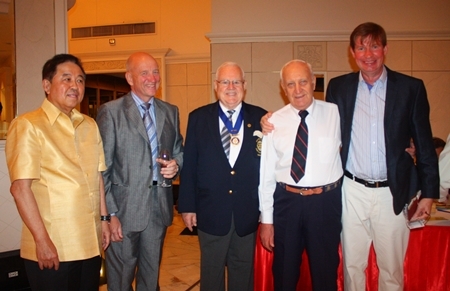 Dennis Stark related his experiences with Louis as a Rotarian. 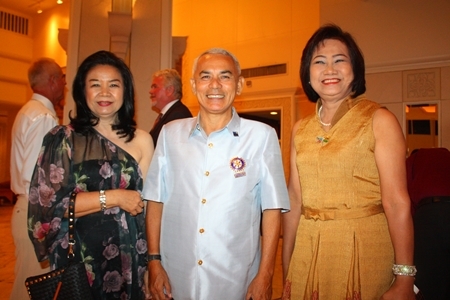 Many hotel general managers were in attendance, universal in their appreciation of what Louis Fassbind had done for Pattaya, indeed placing it on the world’s tourist map. 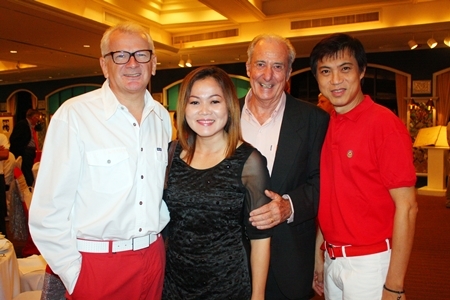 These included Hans Spoerri, Group GM of the Sukosol Hotels in Bangkok and Pattaya; Philippe Delaloye, GM Cape Dara, Pattaya; and Christoph Voegeli, GM of the Royal Cliff Beach Hotels Group. 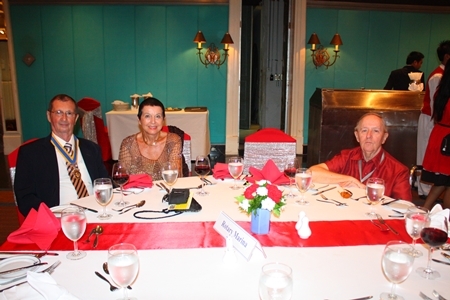 One of the guests who had known Louis Fassbind for more years than most was long-time visitor to Pattaya Archie Dunlop, who will celebrate his 90th birthday in December. Not as old as Archie, but another with many recollections was yachtsman and journalist Peter Cummins, who enjoyed the company and the beer! Peter Malhotra spoke of the life and times of Louis Fassbind. Friends from the good old days included Premprecha Dibbayawan, Dennis Stark, Jan Olav Aamlid, Andrew Wood, Cory Bik, Elfi Seitz, Jim Lumsden, Fredi Schaub, Peter Fässler, Woody Underwood, Gerard Lemmers and Erich Dietl. 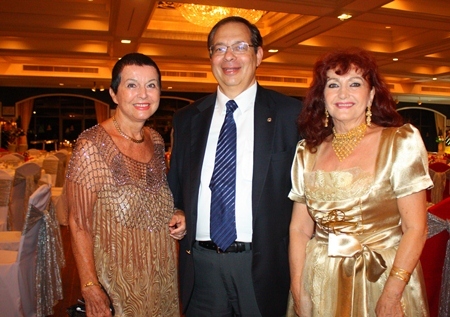 Even Ranjith Chandrasiri, former deputy GM of the Royal Cliff and his wife Chitra flew in from Sri Lanka to attend the memorial dinner for the man who gave him the job at the Royal Cliff just days before he passed away. 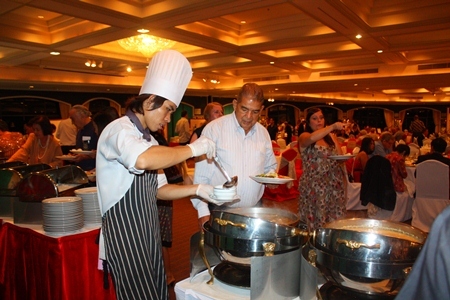 There were many people who helped make the Swiss buffet a success, beginning with the Royal Cliff’s Executive Chef Walter Thenisch, who had worked with Louis Fassbind for many years. He gave the evening’s buffet his extra special touch saying “this one’s for Louis”. The Swiss-Bavarian spread was thoroughly enjoyed by one and all and sent diners back to the buffet line again and again. Many old friends in attendance were quite touched by the way Louis was honoured that evening and what friends and colleagues are doing for the A.X. Fassbind Medical Home for the aged. 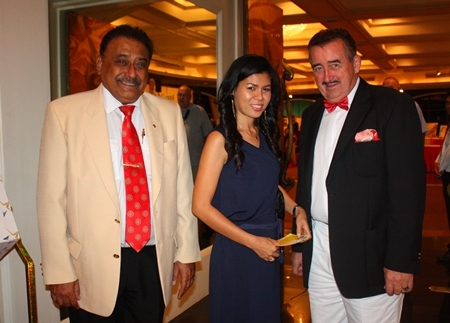 Peter conveyed greetings from Panga Vathanakul, MD of the Royal Cliff Hotels Group, who could not attend because of many commitments on that day, but that she had wholeheartedly supported our endeavour and helped us organise one of the nicest dinners that we ever had. 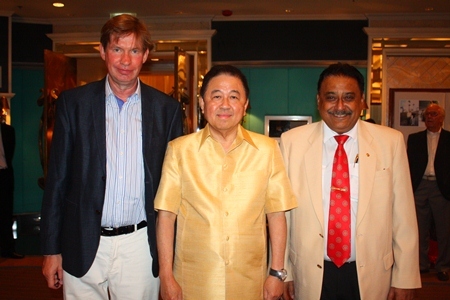 Panga had a close friendship with Louis for over 20 years having worked closely together to make the Royal Cliff one of the topmost and renowned hotels in the world. 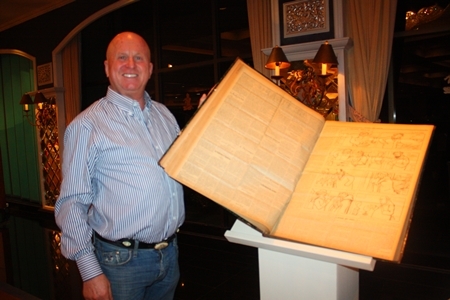 Jan Olav Aamlid delicately shows Woody Underwood a copy of Le Figaro from 1906. At this point the room broke out in thunderous applause of appreciation. 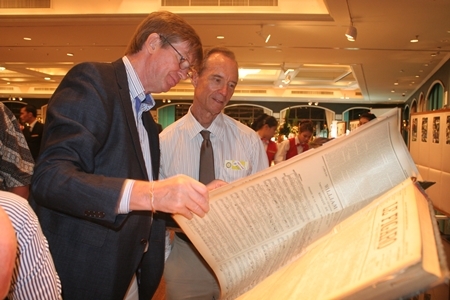 Reinhard Gander bid a handsome price for Le Figaro. 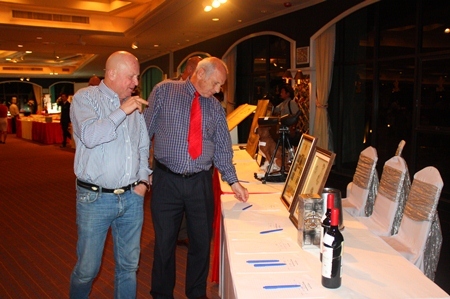 A big thank you goes to our sponsors who donated generously in cash and kind. 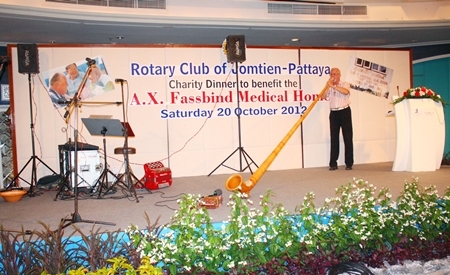 One of the most generous and popular was Ken Whitty, ever supportive of Rotary Jomtien-Pattaya charity fundraisers, who supplied umpteen barrels of Paulaner beer. 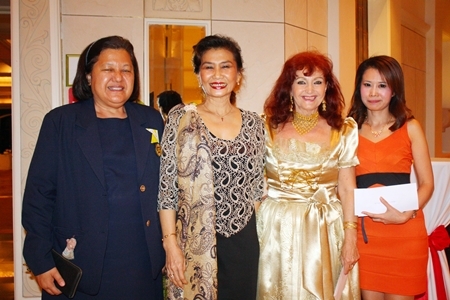 Others included Alois Restaurant, Amari Watergate Bangkok, Bruno’s Restaurant, Collingbourne Auctioneers, Dream Hotel Bangkok, Dusit Thani Pattaya, BBX Thailand, Hard Rock Bali, Royal Cliff Hotels Group, Pan Pan Restaurant, Linda’s Restaurant, Chiva Som Spa Hua Hin, Casa Pascal, High Care Sunbeam Hotel, Hilton Pattaya, Radchada Chomjinda, Les Nations Hotel, Geneva, Marliese Fritz, Max Rommel, Pattaya Mail Media Group, Pattaya Sports Club, PDG Krai and Rungnapa Tungsanga, Pinnacle Hotels Resort & Spas and Sukosol Hotels to name but just a few. 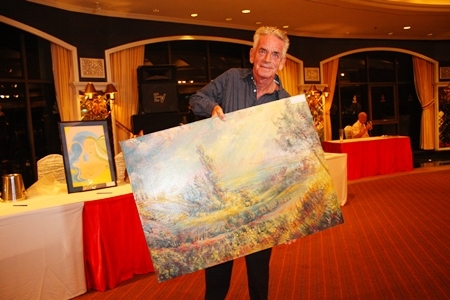 Gerard Lemmers won the bid for the 1942 Pfaelzische Landschaft. 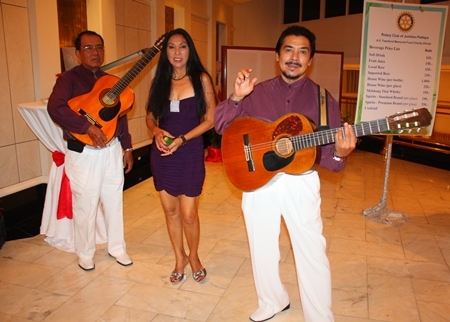 Ruby’s Royal Cliff Trio serenaded the guests as they arrived, followed by Niki Geisbuehler who played and sang Swiss and ‘modern’ songs all evening. This year he also brought along his 10 metre Alphorn and guests were invited to test their skills at blowing it. Three charming ladies from the International Dance Studio performed an exotic belly dance followed by a Flamenco solo. All in the name of charity. As said by Peter Malhotra in his final address, “Louis Fassbind is not dead. He just no longer resides with us.” The continuing presence of the Fassbind Medical Home attests to that. 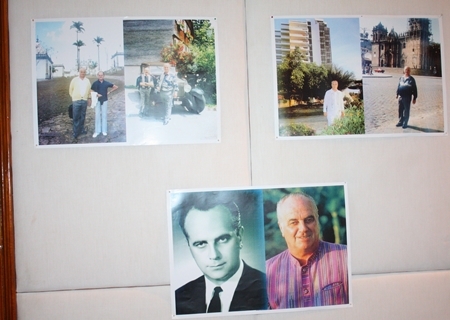 A photo exhibition of Louis Fassbind was displayed in the Royal Summit Chamber. 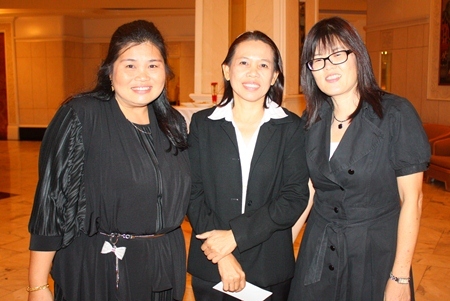 Friends from Rotary Club of Plutaluang (l-r) Sumon Jaikid, Capt. Don Adinand and Onanong Siripornmanut. 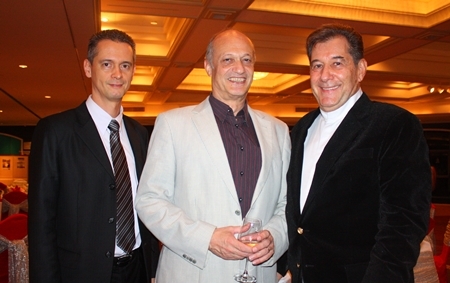 Christoph Voegeli, Philippe Delaloye and Hans Spoerri represent GMs the world over. 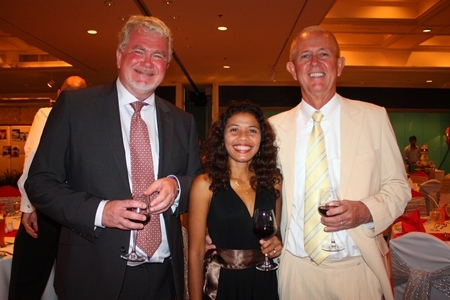 Peter greets John Collingbourne and Yada, two very generous supporters. Peter’s narration of Louis’ life was accompanied by a slide show. 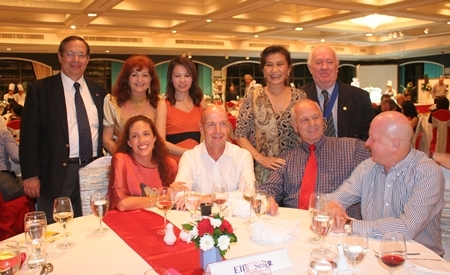 President Joseph Roy and members of the Rotary Club Pattaya Marina. Premprecha and Supanee Dibbayawan arrive with their next of kin Virat and Nora. 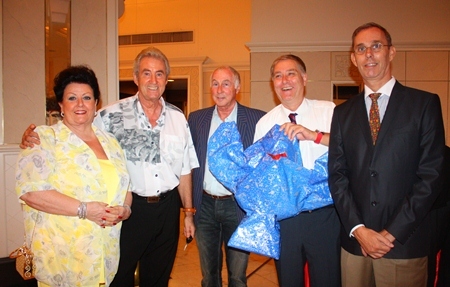 Tim Watten (right) is the happy winner of an iPhone 4S door prize. The Ruby Royal Cliff Trio brought back fond memories. 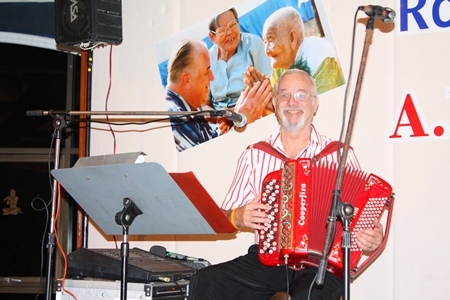 Niki Geisbuehler played happy foot stomping Swiss music. The exotic ‘blonde’ belly dancers raised a few temperatures. Niki Geisbuehler proved a master of the Alphorn. 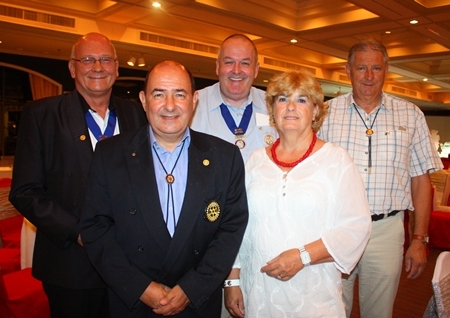 Friends from the Rotary Club Eastern Seaboard. 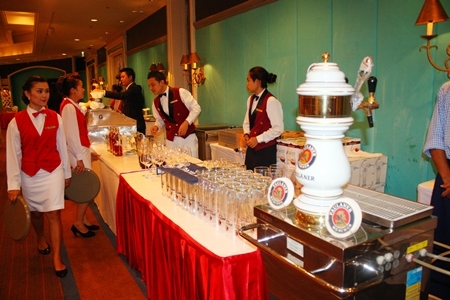 Paulaner beer proved to be the star attraction. Thank you Ken. Old friends meet, Sen. Sutham, Bill, Brendan, Dennis and Jan Olav. 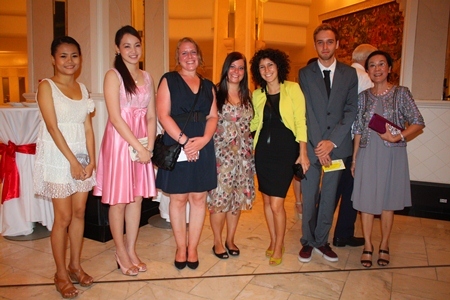 Friends from the YWCA, Rotary clubs and even as far away as Austria gather for a picture. 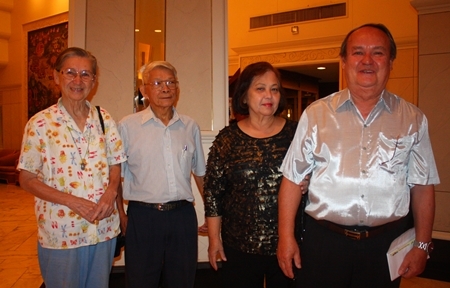 Louis’ die-hard fans, Archie Bunker, Cory Bik, Andrew Wood, Dzenana Popin, Peter Malhotra, Mae Mahaphaisan, Peter Cummins, Elfi Seitz, Pichai Visutriratana and Praweena Jetthumrong, who was Louis’ loyal PA for many years. 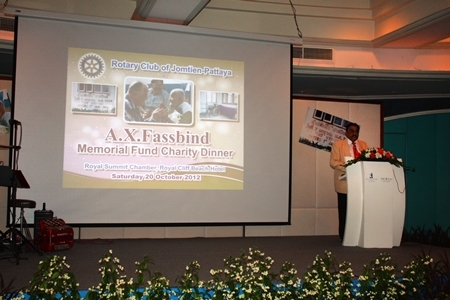 The ballroom was packed with guests helping to raise funds for the A.X. Fassbind Medical Home.